Elizabeth Hughes from Willunga, a small community South West of Adelaide in South Australia contacted me to tell me about her great grandfather, Jesse Shooter, who emigrated to Adelaide, South Australia in 1911 with his wife Emily, her sister Sarah Walsh, and their daughters Rhoda (19 years) and Anne or Nance (9 years). Rhoda had been born in Haworth in 1892. The whole family came from there. As a taster, she sent me photos of Emily and Sarah on arrival in Adelaide, and Jesse and his donkey and cart selling ice cream. He was a street trader in Saltaire, selling “Superior Ices”. Elizabeth’s biological mother was Dorothy Rhoda Coates, daughter of Rhoda Coates (nee Shooter). Image: Jesse Shooter in Saltaire. 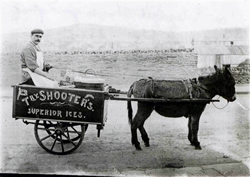 "Try Shooter's Superior Ices". You can see Baildon Hill in the background. The photo may have been taken on Gordon Terrace, or perhaps Canal Road. With grateful thanks to Elizabeth Hughes for sharing these images with us. She also told me that she was researching her family background in this area, and was aware that 3 members were buried in Windhill Cemetery. She asked if I could find out more! Always rising to a challenge, I consulted the Windhill Cemetery plans at Nab Wood Crematorium. Staff there are always incredibly knowledgeable and helpful. I was soon searching through the records to discover a total of 24 family members, buried in 3 main graves. There used to be a small Wesleyan Chapel on Crag Road, and the cemetery was attached to it. Elizabeth’s history is fascinating. She was adopted out of the Shooter family by Alex and Erica Bailey in Adelaide, Australia at 6 months old, and did not have contact with her birth mother until she was 50 years old. By that time she had lived for a time in Britain, in Bristol, London, and Staithes. She had always had a fascination for Yorkshire, and was thrilled when the Haworth and Saltaire link was told to her by her mother. She now lives on 12.5 acres of land in a small community, not unlike Saltaire in size and community spirit. But there aren’t many gum trees in Saltaire and we don’t have temperatures of 40 degrees in January! Elizabeth is now a regular reader of the Sentinel via the saltairevillage.info website. Stay cool, Liz! CORRECTION made to above text, 8 August 2008. “Elizabeth’s biological mother was Dorothy Rhoda Coates, daughter of Rhoda Coates (nee Shooter).” At the beginning of the final paragraph, it should read “Elizabeth’s history is fascinating. She was adopted out of the Shooter family by Alex and Erica Bailey in Adelaide.” It was great to hear from her again and I enclose her most recent email from Willunga. We're suffering a rainy, grey summer here in England, but Elizabeth is obviously making the most of a damp summer at the opposite side of the world. Many thanks Roger for your trouble, much appreciated. We love the weather. It means out tanks are full (we're not on the mains) and we get an extra minute in the shower. Every thing is green and lush and it's great planting weather. I've just put in 18 plum and apricot trees, potatoes and the garlic is thriving. Our day temperature is about 15C and the lavenders, rosemaries and geraniums are a picture. I have a broody goose, so there may be 4 goslings in a few weeks. Spring is fast approaching, the Ravens and magpies are about to free their offspring to the world and if we're fortunate the Tawny Frogmouths also. The rain is welcome as we've got a lot to make up for, it having been a bad drought year. Our dam is still only half full and we're keeping our fingers crossed. How's the book on the street vendors going? A lot of research I imagine. 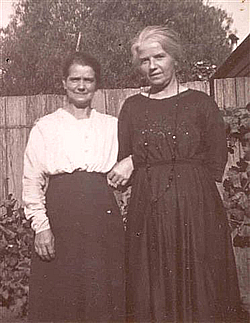 Please find attached a photo of two good Yorkshire lasses after their emigration to Adelaide in 1911. The one on the left is my G-G-Grandmother Emily Shooter with her sister Sarah Walsh. It was taken at the home of Emily and her husband Jesse Shooter, which was named Saltaire. Hi Roger, please find attached a photo of Jesse Shooter, purveyor of Superior Ices. His relatives, Margaret(1831-5/8/1876), William(1882-9/8/1884) and Samuel (1856- 4/1/1899) are buried in Windhill Cragg Cemetery.He emigrated to Adelaide in 1911 with his daughters Rhoda 19yrs(born in Haworth 1892) and Annie(Nance)9 yrs.I am at present researching the ship they came on and other details. You're welcome to use this photo if it is of any use to you.I have other rather nice photos of the family too but none of them at work, other than this one of Jesse. Please note : Anyone with helpful information can get in touch with Liz via the webmaster of this site. An expeditionary force was arranged with Pamela and Patrick Reynolds and their cameras, but an initial recce by my wife Bronwyn and I revealed that there are more gaps in the headstones at Windhill Cemetery than there are in an elderly dental record. We could find no trace of the graves, despite having detailed reference numbers from Nab Wood. So there was nothing to photograph.Elizabeth bore her disappointment well! At least she now had more clues about other, more distant relatives. I traced her family from 1858 up to 1908 in the cemetery but then all trace of them disappeared. Perhaps descendants followed Jessie to the Antipodes! As a reward for all the hard work, Elizabeth emailed me 3 Remembrance Cards which had been sent at the time of her relative’s deaths. Anyone with helpful information can get in touch with Liz Hughes via the webmaster of this site.